Ages 14 and up, one packet up to 2 times per day. Empty contents into a glass, add 4-6 oz of water, stir. For lighter flavor, mix with more water. Adults, one (1) packet per day. Empty contents of one packet into a glass, add 4-6 oz. of cold or cool water, stir. Best if consumed within 30 minutes of mixing. Can be taken with other Emergen-C products, use as directed. Do not exceed suggested use. 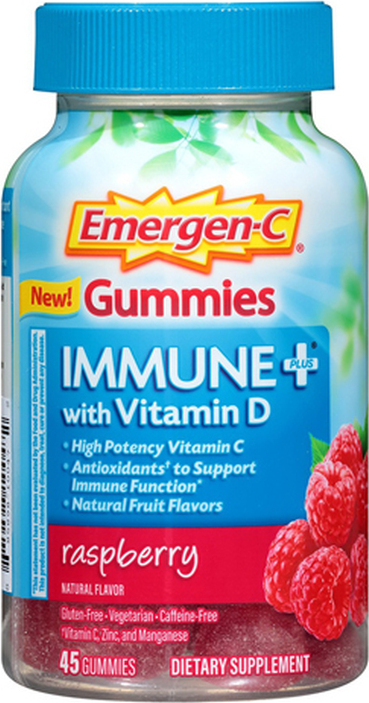 We've supercharged Emergen-C Immune+. Pow! Bam! The power-packed formula provides key nutrients your (super) body needs like vitamin C, vitamin D, zinc, and a proprietary complex with Wellmune WGP beta-glucans. Plus, the delicious Citrus flavor is a sweet and tangy blast for your taste buds! Kapow!